I pushed the new couch into the nook with a feeling of satisfaction. It was supposed to fit with an inch to spare, but after spending a few hundred dollars, I didn’t relax until it was put in. 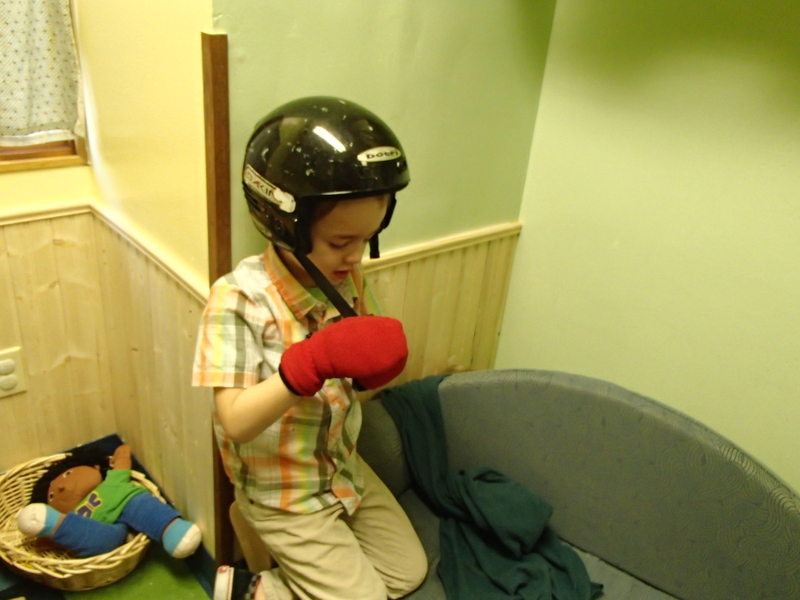 It was just the right size for an odd indentation in my dramatic play area. I had a carpet that fit the rectangle of the space, leaving a two foot bald spot on one side. I was more than thrilled to find this couch that not only provided a cozy play space, but it also covered up the floor. The couch becomes a canoe. The first few weeks, the kids used the couch as a crib, a car, a couch, and a hospital bed. I had found a perfect solution to my problem. But then something happened. One of the kids figured out that if you pulled the couch out from the wall, it created the perfect hideout. The hideout also became a tree house, a tent, a bedroom. Every day it was something new. And every day, as the couch was pushed forward, the rug would scrunch up until it was getting ruined. And if that wasn’t enough the arm of the couch was chipping the paint a bit. I tried to stop the kids from pulling the couch out. That didn’t work of course. I tried to be there when they moved the couch, but every time I walked over, the couch was moved and the rug was bunched up. I tried to show them how to lift it on top of the rug. That wasn’t any more successful. I was getting quite frustrated. I could only flatten the rug back so many times before it was ruined. I could stay late and paint the wall, but how long would that last? When I finally stepped back, I saw a different picture. The kids were showing me they wanted a small space to play in. They also seemed to take satisfaction in being the creators of this space. The stumbling block was the carpet, which was made up of smaller square tiles. I decided to remove one more row to see what would happen. It left a bigger bald spot, which bothered me, but I’ve lived with bald spots before. The next day the kids pulled the couch out until it touched the rug. A father who worked as a contractor asked if I needed anything done and I showed him the chipped paint. He brought in a few scraps of wainscoting and covered the walls. Suddenly, the area looked inviting again. And the kids continued to use the space behind the couch. It doesn’t matter how many years I have been doing this, I still find myself taking on battles that I can’t win. When I focus on the needs of the kids, I can usually find a way where we both win. In the last few years I have used guidelines instead of rules. Dan Gartrell talks about the benefits of guidelines rather than rules in his book, Education for a Civil Society: How Guidance Teaches young Children Democratic Life Skills. Rules talk about what children can’t do. Guidelines talk about what we can. Guidelines also allow for gray areas that often happen. For example, we have a loft in my classroom that looks down on the classroom on three sides. Originally I had a rule that you couldn’t throw things down from the loft. It seemed straight forward, but situations kept coming up that called this rule into question. A child made a paper airplane, and threw it from the loft. 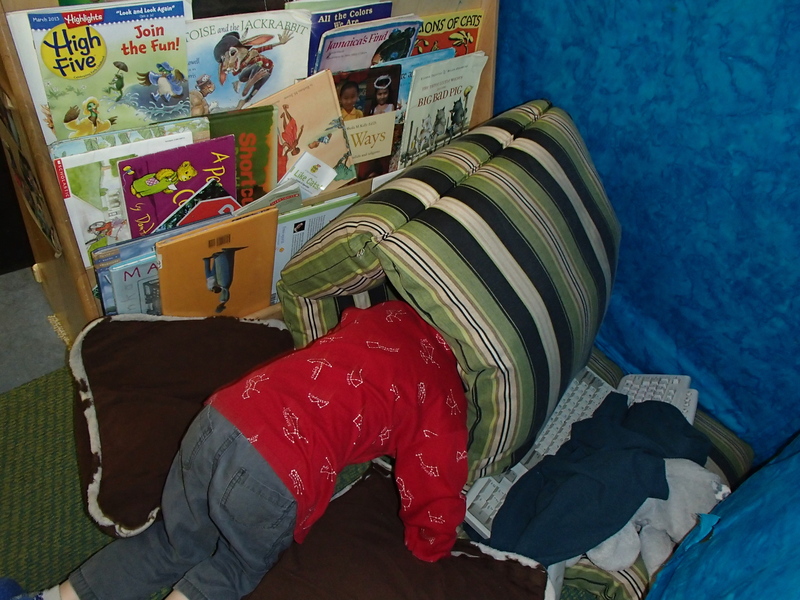 Then a few weeks later a group of children had a pillow fight with some throwing pillows from the loft. Later a child watched a tissue float down from the loft. None of these situations presented a safety concern. I could make a rule that lists all the things you can’t throw. I could even put a positive spin on it and list the things you can throw. But what happens when someone introducing something not on the list? What if someone crumples paper and throws it? When I started using guidelines, I could say, “We take care of each other so we can’t throw toys form the loft because they are hard and could hurt someone.” When a child makes an airplane, I can say, “Are we still taking care of each other if you throw a paper airplane?” The child can figure out that no one will get hurt. Not only did I get rid of unnecessary rules, I am helping the kids to practice risk assessment in a safe way. This also brings up rules that many of us consider universal such as “No running in the room.” While running in the room in general might pose a safety concern that children may not be able to anticipate on their own. There is a lot of gray area in terms of what is running. For example: Is jogging OK? Isn’t a five-year old skipping more likely to result in falling that if the same child was running? I have found myself watching children “running” in the room with enough control to stay safe on several occasions. I have also watched kids “use their walking feet” and walk right into someone who was in their way. Is it really the speed that is the problem or the child being in control of their movement? In regards to the child who walks into another child, it is often a result of a still-developing vestibular sense rather than a deliberate act of aggression. What will the child learn if I say, “No pushing?” And if I have the rule “No Pushing” what about two kids who smile as they push each other? Can’t children roughhouse? No running, No Pushing and No Throwing Toys can seem like universal rules, but in the end, I am convinced there are no universal rules, but I am convinced that there are universal guidelines. 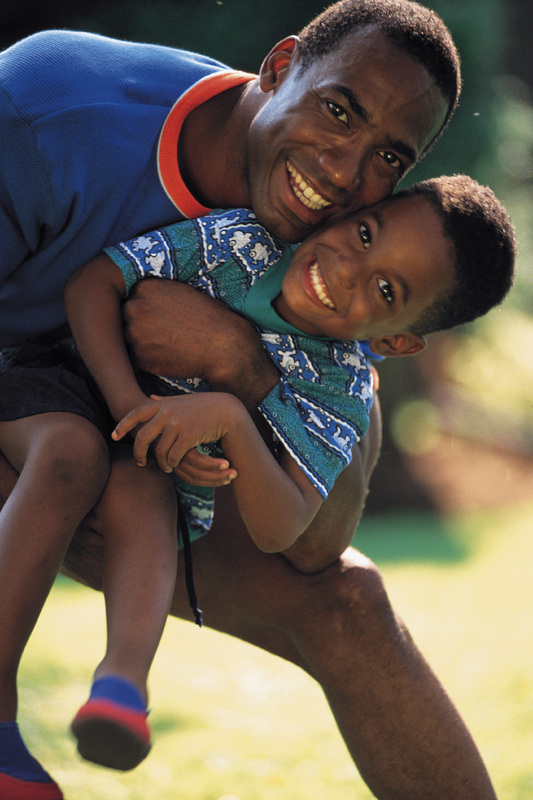 Using guidelines means that the children and I have to use our judgment when situations arise. It is good for the children to learn and it is good practice for teachers to always reflect on their actions. I was renovating my book area in my classroom. It’s small, no room for a chair. But that was OK. I wanted to make it cozy. I put a cushion along the wall with matching pillows. I pictured children sitting together or with an adult, leaning on the pillows or each other and looking at books in a quiet and peaceful setting. I knew this was a great way for children to bond with each other or with a teacher. 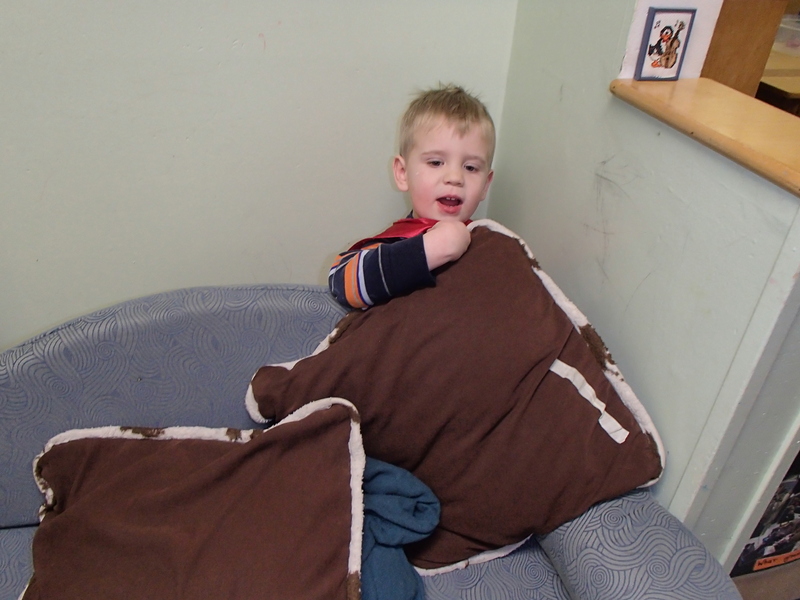 Within a few minutes, Nate picked up a pillow and threw it at Calvin. Soon they were both tossing pillows back and forth. Time to put away my intentions and observe the intentions of the children. I could become disappointed that I failed, or I could open my eyes and see that they are bonding. It might not be a book. It might not be quiet. 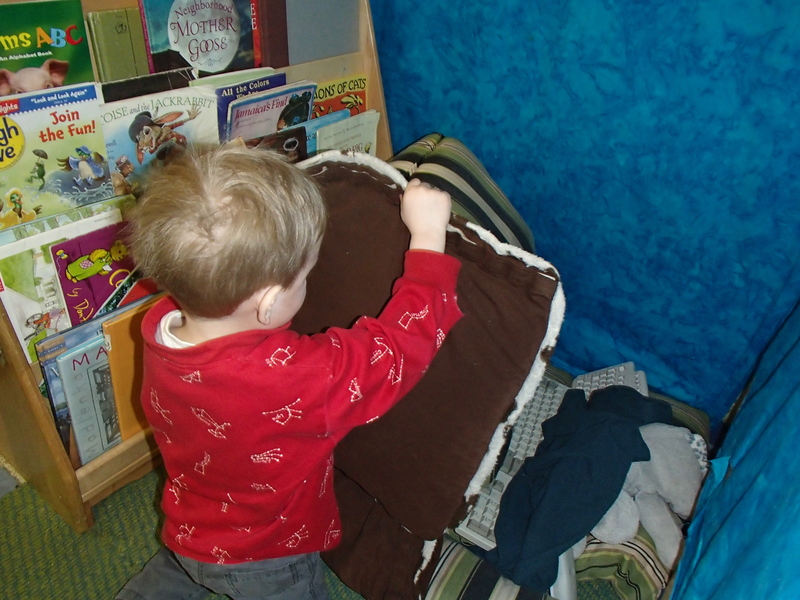 But with each bop of a pillow, they are creating bonds that are the building blocks of friendship. This was the only way I saw Nate express friendship. Nate and I had a good relationship, but he was not what I would call cuddly. One day, Molly was wearing a red cape with a hood. Nate told her he was the Big Bad Wolf. She started to run and he chased her. My first instinct was to tell him that they can’t run in the classroom. It’s not really a rule. We use guidelines not rules and the guideline is “WE TAKE CARE OF EACH OTHER.” So I watched closer to see if they were taking care of each other. The two were in control enough that they didn’t bump into chairs or tables. Then I noticed something even more impressive. If someone walked in the path they were using, Nate would change paths about ten feet before he reached that person (By this time Nate had run so far ahead in their circular path that Molly was now chasing him). He did it three different times so I know it wasn’t just a fluke. They continued this game for about ten minutes and then Nate stopped at the book shelf. He grabbed Little Red Riding Hood (the book, not Molly) and breathlessly asked me to read to him. I leaned against the cushions in the book area and Nate rested his head on my arm while I read. We read three more books. Nate and I did bond while sitting quietly, but he needed to play boisterously first. He didn’t have to choose between a quiet activity or a loud one. He needed both. I am currently working on a book called Teaching with the Body In Mind. It is a book aimed at teachers and caregivers of young children. The book addresses the need for more rough-and-tumble play and Big Body Play for young children. My blog will be focusing on some of the same topic for the next few months. I want to start with a story from early in my teaching career (about 23 years ago). It’s about a man named Duke. I haven’t thought about Duke in a while, but I was speaking at the MN Fatherhood and Family Services Summit and the story came to me. Duke was one of the Dad’s at the childcare center I worked at in the early 90s. Duke was unemployed at the time when our cook left. Our director offered him the job. Duke gladly accepted and we were soon enjoying the lunches he cooked as well as his visits to the classrooms. The kids loved having him visit, and Duke clearly loved being there. After a few weeks, the director asked if he wanted to substitute for one of the aides in the afternoon. Soon he was subbing a few times a week in one of the classrooms. Our classrooms were fairly typical of the time. There was a block area with plenty of blocks, a dress up area with lots of costumes, several choices of toys and lots of art supplies. But when Duke was in the classroom, most kids forgot about all our precious materials. They wanted to play with Duke. Duke offered the children something me and the other teachers did not. Duke loved to roughhouse. If he was in the room, he usually had one kid in his arms (often upside down) with two or three kids grabbing his legs, everyone shrieking in delight. I hate to admit it, but we other teachers often asked Duke to tone it down. At best we tolerated Duke’s roughhousing, but we certainly didn’t try to emulate or even learn from him. Looking back, I can see that Duke was giving children something they desperately need. Research now shows what Duke instinctively knew. 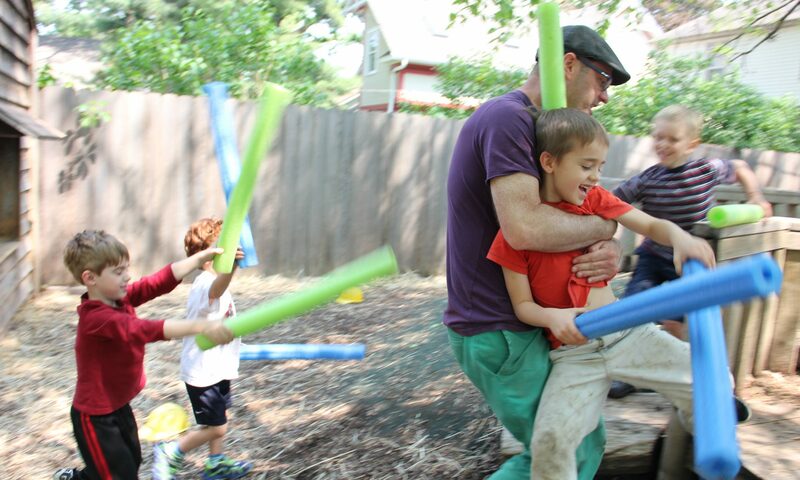 Rough-and-tumble play is good for children and it is a great way for an adult to connect with children. It only took me 20 years to catch up with Duke.